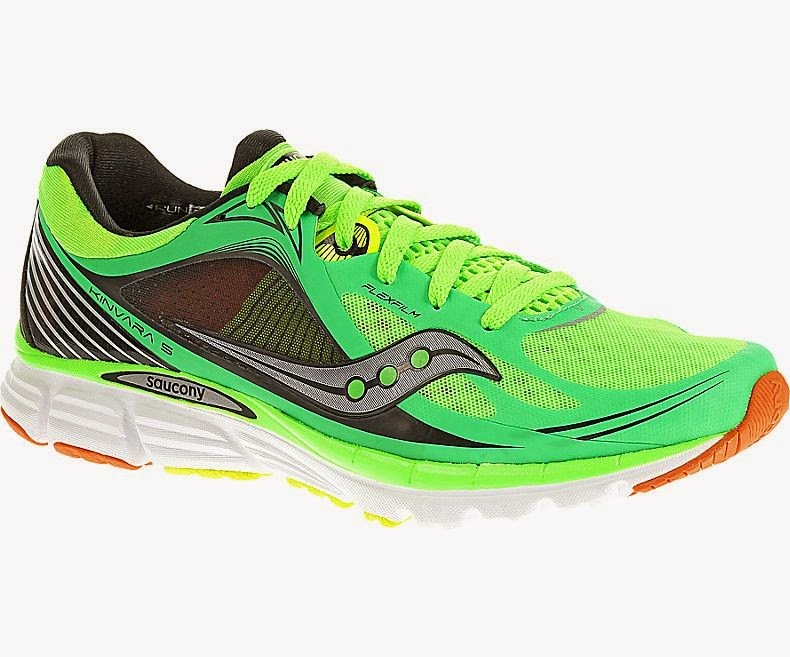 Then everything changed when I heard Saucony was making some big changes to the Kinvara 5. A bigger toebox, full length powergrid and a special heel cup..... I was excited but didn't want to get my hopes up. Then when they finally dropped.... I felt like it was a combination of Hanukkah and Christmas (I come from a multireligion household). The Kinvara 5 is everything I hoped it would be. Read on to find out my thoughts. Sole: The first thing I have to say about the new sole is that it feels nice and simple. No crazy bells and whistles. The new sole has just enough cushioning for long runs but enough pop for all out sprint strides. 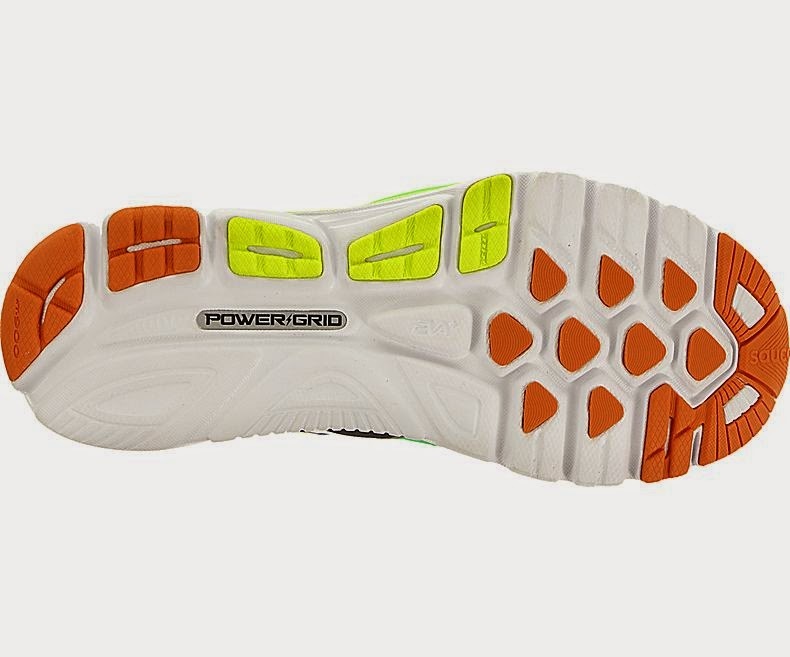 The powergrid cushioning along with Saucony's EVA+ is very noticeable to me as I vividly remember the Kinvara 4. The Kinvara 5 has a softer feel in such a way that reminds me that this shoe wants to protect my feet but also has the responsiveness I would associate with a lightweight trainer/marathon racer. I would call it the Brooks Launch of 4mm drop shoes (or is the Brooks Launch the Kinvara of lightweight trainers?). I could definitely see someone using this as a lightweight trainer or a half/full marathon racer. It can really do everything and I have used it as such. Hills, tempo runs, 300 repeats, sprints. The lugs on the bottom work well on trails as well. Obviously the Kinvara 5 isn't the Peregrine, but it definitely is much more road friendly and can handle any terrain you throw at it. I would really call the Kinvara 5 the Jack of All Trades shoe. Upper/Fit: Oh yes. It's so good. The second I put this shoe, the upper fit perfectly to my foot. I'm usually a size 10 and the Kinvara 5 fit me perfectly in that size. The toebox is much improved and roomier than the Kinvara 4. No longer does the front dive in and smash my 1st and 5th digits. The Kinvara 5 has the perfect width for me in that I have plenty of room in the front but do not slide around at all. This shoe has the Goldilocks of uppers. I really like the ProLock technology in the midfoot as it hugged my foot nicely without being compressive and secured my foot extremely well. And that heel cup? It feels SOOOOO good on bare skin. Every mile after the first 60 miles I ran in the Kinvara 5 was sockless. Completely sockless. I never had a single chaffing issue and I took this shoe up to 17 miles on trails. Rumor had it that the Saucony Team was trying to design this shoe to be worn sockless. I would say they achieved this goal. However, on my second pair (yep, already working through the second one), I had some chaffing issues the first 50 miles and then after was fine. So the upper needs some time to break in. As always, everyone is different, so proceed with caution on the whole sockless running thing. I do love my Injinji socks a great deal. Oh baby. It's so good. That upper. Responsiveness: As I mentioned this shoe has just enough cushioning and responsiveness to handle any type of workout you undertake. The 7.7 ounces really helps make it light enough to never be in the way of high leg turnover and the sole responds well to high speeds. Even on trails the shoe feels fast enough to race in but protective enough to do a long slow recovery. I began training in this shoe during a recovery period of my training. By that I mean I wasn't doing very many workouts because I felt like the end of the summer semester of the 1st year of DPT school was eating me alive (everything turned out great though). The workouts I did do were surprisingly fast. 3 mile tempos at 5:10 pace, uphill trail tempo runs, 200m hill repeats. All of these went very well despite the high level of stress I was under. I'd like to partially credit the Kinvara 5 for having enough of a lightweight and responsive feel to remind me that it was time for a workout. And just the way it is responsive enough workouts, the shoe has just enough cushioning to handle longer runs without destroying my feet. I would again liken it to the Brooks Launch but just a hair firmer. Again... a Goldilocks shoe. 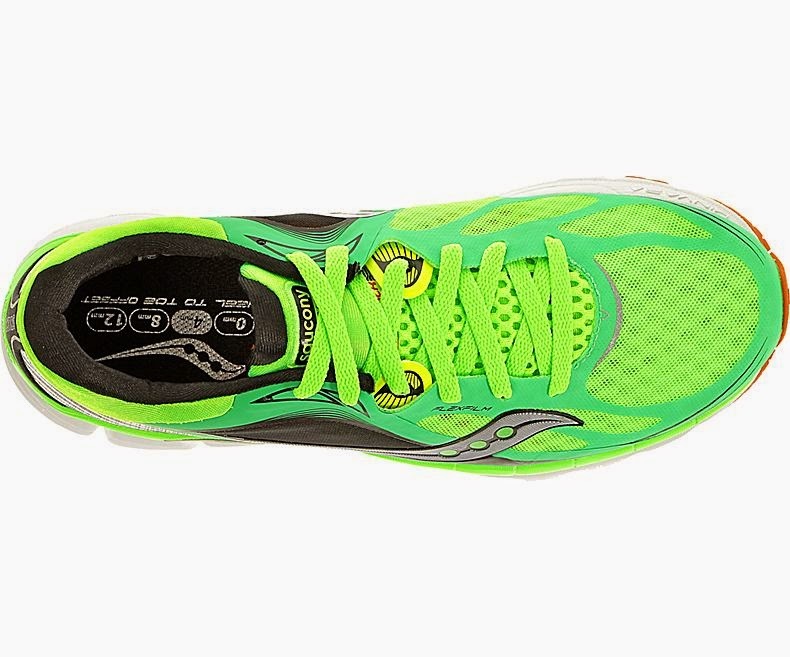 Heel-Toe Drop/Ramp: As always the Kinvara is listed as a 4mm drop shoe, but it feels a bit more than that. Obviously the heel-toe drop will feel different depending on the shoe. To me the Kinvara 5 felt more like 5-6mm drop but in a good way. My calves weren't completely wrecked when I got up in the morning but my stride never felt inhibited. There was just enough there to be a middle child between the current 8-10mm drop shoes and the 0-4mm drop shoes. Durability: The most surprising part? I took my first pair of Kinvara 5s to 350 miles. The most I ever got out of the Kinvara 1 was 230 miles. I probably could have kept going on my first pair of 5s but didn't want to chance an injury. Really the only thing that wore out was the sole. Long gone are the days when you would blow a hole in the upper at 150 miles. This upper is extremely durable. I never saw any signs of wear (other than dirt and scuff marks) or seams busting. I am extremely impressed by what Saucony has done with the upper of this shoe. Everyone knew the stereotype about how terrible the upper durability was on the previous 4 versions. The 5th version is a completely different shoe in that regard. 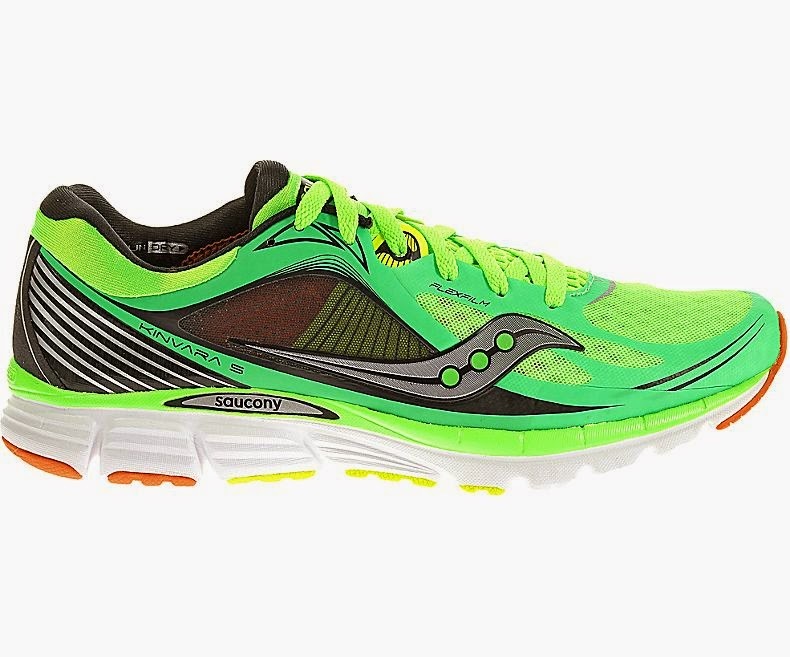 Weight: Saucony lists this shoe at 7.7 ounces and I would agree with that. Other sources will tell you there is some 0.1 ounce variation between models, but who really cares about 0.1 ounce in a lightweight training shoe. This falls in the perfect weight category that I like in a training shoe. High 7 ounces to mid 9 ounce shoes. Being on the lighter side of that spectrum, you could definitely get away with doing some serious racing in the Kinvara 5. It has a fantastic balance between weight, cushioning and responsiveness that can handle any distance (obviously depending on the person). Thoughts as a Physical Therapy Student: I just like how simple this shoe. Any support comes from the higher arch that Saucony is known for and the ProLock technology. But the arch is EVA so it does not intrude into your foot. 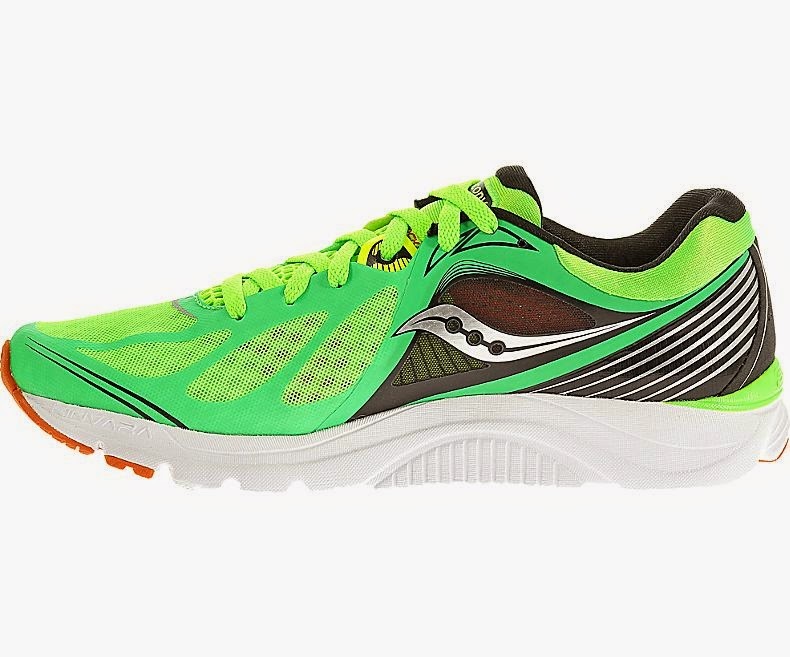 Instead your foot will be cupped nicely and held to the platform (the Kinvara 5 is listed as a neutral shoe). There are no crazy bells or whistles in the sole of this shoe so just protects your foot and lets it do its thing to a degree. Combined with the wonderful toebox and the (what feels like) 5-6mm drop it is a fantastic shoe. I have no complaints with this shoe from a medical or biomechanical standpoint. Obviously if you have a severe restriction in calf length, foot/lower extremity foot strength or have some kind of foot deformity that requires you to have an orthosis, this shoe may not work for you. Otherwise, I highly recommend this shoe. Even just to try it, have a lightweight shoe in your rotation or to use as a racing shoe. Final Thoughts: I definitely think of the Kinvara 5 as the Goldilocks shoe. I also realize I've already said that multiple times. It really is the perfect balance of a shoe, although I wouldn't mind Saucony adding a bit more to the sole and bumping it up to 8 ounces. I realize that sounds sacrilegious to the Church of Kinvara, but for all that it can do, the Kinvara is a lightweight trainer/marathon racer. I tend to think of it more as a lightweight trainer and wouldn't mind just a hair more there. That's personal preference. Or Saucony could just keep it like it is because they really did an unbelievable job on this shoe. The upper is fantastic, the sole is nice and simple, the shoe can handle any workout or race and it is surprisingly durable (at least compared to the previous versions). I have really enjoyed my time training in the Kinvara 5 and plan to continue doing so. I want to thank the Saucony team for rekindling my love with the Kinvara series. I highly suggest giving them a try! These shoes were a personal purchase and I put at least 100 miles on every pair of shoes before I review them (except racing flats which I put in at least 75 miles). Currently I have 350 miles on my first pair and 125 miles on my second pair. *Images obtained from the Saucony website. Go down to your local running specialty retailer to check them out!